Aspen Mountain 1A stakeholders narrow replacement options to a few alignments with a two-stage lift or pulse gondola still in the mix. Crystal Mountain, WA retires its hand-painted trail map for a computer-rendered VistaMap. Antelope Butte, Wyoming inches closer to reopening with its two existing Riblet chairlifts. Local paper tells the story of how Borvig’s owner came to own Berthoud Pass. Breckenridge and Vail debut new Leitner-Poma six-place lifts. A power outage closes Sugarloaf on the always-busy day after Christmas. Two different New Hampshire ski areas remain closed due to problems with lifts. LST detachable lift number one is still undergoing testing in France with opening now planned for January. Bromley’s Sun Mountain Express is back in action today following Monday’s incident. Ironically, it’s currently on wind hold. None of the 115 skiers and snowboarders riding the Sun Mountain Express at Bromley Mountain, Vermont were injured yesterday despite a serious wind-related incident. The Burlington Free Press reports a gust caused at least one empty chair to contact a communications line while the lift was moving. “The cable snagged a grip on an empty chair, derailing it and causing the lift to stop,” the paper wrote. It’s not clear from the article whether the snagged grip and chair remained on the haul rope. Bromley’s Assistant General Manager Michael van Eyck commented to the media, “a super high 20 or 25 second burst of wind” led to the accident. “The winds were not predicted to be that high,” he noted. A rope evacuation was initiated following the deropement, which took two and a third hours to complete. The Sun Mountain Express is a mile-long detachable quad featuring torsion grips built in 1997. The Doppelmayr lift services the vast majority of Bromley’s terrain and remained closed the rest of Christmas Day and this morning. The mountain’s snow report currently reads: “the Sun Mountain Express will be on a delayed opening schedule today, while it undergoes some maintenance. Stay tuned for updates on its projected opening time, but our lift crew is working hard and should have it up and running by this afternoon.” Poor Bromley also lost its primary snowmaking pump house to fire just ten days ago. The family-focused ski area is owned by the Fairbank Group, which also operates Jiminy Peak, Massachusetts and Cranmore, New Hampshire. 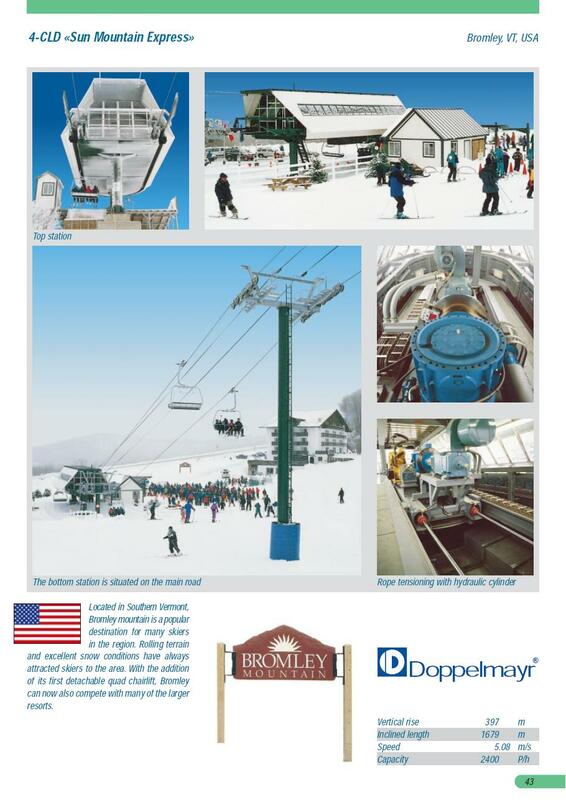 I haven’t taken pictures of the lifts at Bromley yet, but this is the Doppelmayr Worldbook entry for the Sun Mountain Express.